This article is about the current university. For the former, see Illinois State University (Springfield, Illinois). Illinois State University (ISU) is a public university in Normal, Illinois. Founded in 1857 as Illinois State Normal University, it is the oldest public university in Illinois. The university emphasizes teaching and is recognized as one of the top ten largest producers of teachers in the US according to the American Association of Colleges of Teacher Education. The university's athletic teams are members of the Missouri Valley Conference and the Missouri Valley Football Conference and are known as the "Redbirds," in reference to the state bird, the cardinal. Illinois State University's campus is in Normal near the geographic center of the state, 137 miles southwest of Chicago and 164 miles northeast of St. Louis. Interstates 74, 55, and 39; U.S. Route 150; and Illinois Route 9 intersect around Normal, creating a transportation hub. An Amtrak passenger station is just two blocks from the university. ISU was founded as a training school for teachers in 1857, the same year Illinois' first Board of Education was convened and two years after the Free School Act was passed by the state legislature. Among its supporters were judge and future Supreme Court Justice, David Davis and local businessman and land holder Jesse W. Fell whose friend, Abraham Lincoln, was the attorney hired by the board of education to draw up legal documents to secure the school's funding. Founded as Illinois State Normal University, its name was reflective of its primary mission as a normal school. Classes were initially held in downtown Bloomington, occupying space in Major's Hall, which was previously the site of Lincoln's "Lost Speech." With the completion of Old Main in 1860, the school moved to its current campus in what was then the village of North Bloomington, which was chartered as "Normal" in 1865. The new town had named itself after the university. In 1965, the institution's name was changed to Illinois State University at Normal, and then again in 1968 to the current Illinois State University. In accordance with its mission, the school's motto was originally "and gladly wold he lerne and gladly teche," in the Middle English spelling of Geoffrey Chaucer which has since been updated to modern English in the gender-neutral form "Gladly we Learn and Teach." Founded as a teachers' college, the university now offers a range of programs at the bachelor, master, and doctoral levels. Illinois State is accredited by the Commission on Institutions of Higher Education of the North Central Association of Colleges and Secondary Schools. The teacher preparation programs are accredited by the National Council for Accreditation of Teacher Education and certified by the Illinois State Board of Education. In addition, 22 programs hold discipline-based accreditation. In 2019, U.S. News & World Report ranked Illinois State University (tied for) 171 among a combined list of America's best 310 private and public "national universities" and (tied for) 91 among 133 public "national universities" in the United States that qualified for the list. Forbes magazine ranks Illinois State #409 out of 650 American colleges. As of the fall of 2016, total on-campus enrollment was 21,039, with 18,643 undergraduate students and 2,396 graduate students. 56 percent of students are female, while 44 percent are male. 18.2% of all students were from minority groups. 382 international students from 66 countries are enrolled. The average new beginning student had an ACT score of 23.7. The student-faculty ratio is 18 to one. The Illinois State University campus quadrangle is compact compared with other large universities, with buildings spaced closely together around a rectangular center lawn. The Quad is a popular site for small special events including movies and concerts and University Program Board's Festival ISU, where campus organizations set up tables with games, prizes, and information about their organizations. Lined with benches and shady trees, the site is a popular spot for students to relax, study, and play informal games of sports. The ISU Quad is also host to the Fell Arboretum, which is part of a 490-acre site that represents over 154 species of trees from the state of Illinois. Trees on the north side of the quad are from Northern Illinois and those on the south side of the quad from southern parts of the state. The Fell Arboretum won the Tree Campus USA award in 2008. Milner Library has a collection of more than 1.5 million volumes and an ever-increasing number of electronic materials accessible by the Internet to students and faculty. The library's collection is distinguished by materials related to educational theory and policy, curriculum development, and issues related to special education and assistive technology. The Special Collections include extensive Circus and Allied Arts materials and a children's literature collection that features more than 100 first edition volumes signed by author Lois Lenski. Milner Library is also a selective federal depository for government information. Combined Milner's collections contribute to the university's relatively high standing in regional, national, and world rankings. In 2007, the library received the John Cotton Dana Library Public Relations Award, an award given to only seven libraries nationwide. Milner Library administers the Dr. Jo Ann Rayfield University Archives, which houses selected official records from university departments and organizations, faculty and student publications and local history materials including a collection from the Adlai Stevenson family. The archives also houses an Illinois Regional Archives Depository (IRAD). Additional library facilities include book storage both on and off-site as well as a preservation department. The Milner Library was named for Angeline "Ange" Vernon Milner (1856–1928), a Bloomington-Normal native and the first full-time librarian of Illinois State Normal University. Milner is credited with organizing the university's initial collection of more than 40,000 items and was a prolific author of more than seventy articles and short monographs in library and education journals during her tenure as University Librarian from 1890 to 1927. The library building, the third in the university's history, opened in 1976. Illinois State University's seven residence halls house about 6,000 students. Administered by the ISU's University Housing Services, they include lifestyle floors that serve residents with shared interests. Watterson Towers is not only the largest residence hall on campus, it is also one of the world's tallest student residence halls, and provides the highest vantage point in Illinois between Chicago and St. Louis. Watterson features areas for wellness, quiet, substance-free, and restricted visitation. Built between 1968 and 1970, the facility is named for Arthur W. Watterson, a geography faculty member and chair. Watterson went through a massive renovation from March 2010 through August 2012. Watterson's twin towers each have five "houses." Each "house" has five floors with each floor divided into four suites. Each of the 10 houses is named after former United States Secretaries of State. Hewett and Manchester Hall are in East Campus. Built in 1966, they were named after Edwin C. Hewett, the third University president, and Orson L. Manchester, Illinois State Normal University dean from 1911 to 1928. Both are for the most part coed, with specialty floors designated as all male or all female. Until recently, Hewett was all-female. Between both Hewett and Manchester, there are floors dedicated to students majoring in art, business, communication, co-sciences, curriculum and instruction, Geo-Environmental, Honors, Information Technology, Math, and Music. Other floors are dedicated to students with interests and preferences such as service and leadership, substance-free, quiet, and international house. These residence halls were renovated in 2008–09. During this renovation, the dining center in the basement between each hall was transformed into the Julia N. Visor Center which is dedicated to helping students achieve academic success through free tutoring and other services. Haynie, Wilkins, and Wright Hall are in West Campus, next to Redbird Arena and Hancock Stadium. Also known as "The Tri Towers", they feature floors for ROTC, Wellness, Substance-Free, and Quiet. These halls are the most remote residence facilities on campus and are known for housing a majority of athletes because of their proximity to practice areas. They were built in 1962 and named for Martha D.L. Haynie, the first female Illinois State Normal University professor, Daniel Wilkins, principal of the Female School Institute of Bloomington in the 1850s, and Simeon Wright, one of the university's founders. In 2012, the university opened the new Cardinal Court Apartments to replace a complex by the same name and on the same site built in 1959. Much like the old Cardinal Court, the new Cardinal Court provides apartment-style living combined with the benefits of university housing. Besides simply being more modern, the primary difference is that the old Cardinal Court had been reserved for married couples and graduate students. Until recently, there were several residence halls in what has been known as "South Campus". There are no longer any students housed in the area now, and the buildings have been decommissioned. They were demolished in the summer of 2016. Hamilton and Whitten Hall (aka "Ham-Whit) shared a joint entrance and front desk. They featured lifestyle floors such as Upper-class and Graduate, Student Nursing, and Speech Pathology and Audiology. Constructed in 1959, the facility was named for Alma H. Hamilton, the first recipient of an Illinois State Normal University bachelor degree, and Jennie Whitten, the former head of the Foreign Language Department. Atkin and Colby Hall, though built later than "Ham-Whit", were essentially a mirror image of the former, and shared a dining center with the same. Built in 1962 as female-only dorms, they were converted to co-ed. They were named for Edith Irene Atkin, Illinois State Normal University mathematics professor from 1909 to 1940 and June Rose Colby, English professor from 1892 to 1932. Three residence halls, Dunn, Barton, and Walker Hall, were demolished in 2008 to provide space for the Student Fitness, Kinesiology and Recreation Center. The school publishes two newspapers, The Vidette and The Indy, the latter being an alternative weekly publication. ISU owns a public radio station WGLT ("News, Blues and All That Jazz"), which broadcasts on 89.1 in Normal, 103.5 in Peoria, and by streaming audio. The call letters are from keywords of the school's motto: "Gladly-Learn-Teach." The university also maintains a student radio station, WZND. On January 20, 2010, WZND changed its format from a dual format (Rock and Jamz) to a college shuffle format. The station broadcasts on 103.3 FM, channels 4 & 5 in the residence halls and on the web. TV-10, a part of the School of Communication, provides the only live local television newscast produced entirely in Bloomington-Normal. Illinois State is home to over 350 registered student organizations or "RSOs". These organizations can range from intramural sports to branches of nationally recognized student organizations. Every year RSOs are able to advertise themselves to students during Festival ISU where RSOs can reserve a booth on the quad where they can meet passing students looking to join an organization. Illinois State University also boasts one of the largest student spirit organizations in the United States, RED ALERT. This registered student organization has over 4,100 members, roughly one fourth of the student body. The group was founded in 2006 to promote student involvement in university athletics and has grown exponentially. ISU is also the home of the Gamma Phi Circus, the oldest collegiate circus in the world, founded in 1929. It is one of two collegiate circuses in the US; the other is run by Florida State University. The Student Government Association at Illinois State University is a unique governing body for the ISU Student Body. It is unique in that it sends 21 voting student members to serve on the Academic Senate which is composed of student, faculty, staff, and administrators. This place in the shared governance of the university is rare among universities giving ISU Students a major voice on campus. The Illinois State University Greek community was established in 1967. Currently about 14% of the student population are active members of Greek Life. Greek organizations provide students with a wide range of academic, social, and leadership opportunities. In the 2015–2016 academic year fraternity and sorority members collectively raised $175,054 for charities and volunteered 44,864 hours of community service. Fraternity and Sorority members had an average GPA of 3.02 in 2016. The ISU Forensics Individual Events team is one of the most successful forensics individual events teams in the country. In 1995, 1999, and 2000 it won the National Forensic Association team championship and in 2005 its team won the American Forensic Association team championship. Illinois State has been selected as the host of the 2011 NFA National Championship. Famous alumni include Nelsan Ellis of HBO's True Blood. The Illinois State Club Baseball team was ranked No. 18 in the country in the spring of 2010 for much of the year, but ultimately finished second in the Great Lakes South Conference behind the University of Illinois. The Redbirds compiled a 15–5 overall record, including 9–4 in conference. The Illinois State University Mock Trial Team has enjoyed continue success since its inception in 1987. The team competes in intercollegiate tournaments sponsored by AMTA (American Mock Trial Association). In 2004, they won the National Championship after defeating Gonzaga University in the final round. The team is consistently ranked as a top 5 team in the Midwest. The ISU Solar Car Team was founded in 2005 and has earned two 2nd place(2011, 2013) a 3rd place(2015) a 4th place (2012) and a 5th place (2009) finish in the Formula Sun Grand Prix. The team has also finished 7th (2013), 11th (2010) and 18th (2005) in the American Solar Challenge and 13th in the Abu Dhabi Solar Challenge. The school's fight song is "Go, You Redbirds", a song written specifically for ISU and frequently played at sporting events. The Alma Mater song, also played at sporting events from time to time, is "Glory Hast Thou," written to the tune of Haydn's "Gott erhalte Franz den Kaiser," and better known as the tune used for "Deutschlandlied," the German national anthem. The ghost of Angeline Vernon Milner, the university's first librarian, is said to haunt the former library building, now called Williams Hall. Built in 1940, the building was named in honor of Milner who served as University Librarian from 1890 until her retirement in 1927. Beginning in the 1990s, personnel working in the book storage and archives facilities formerly housed in Williams Hall reported encounters with what they believe to be the ghost of Milner. The historic Eyestone School with Redbird Arena in the background. The university has two laboratory schools: University High School and Thomas Metcalf Laboratory School. The Illinois State University Alumni Center, located at 1101 N. Main in Normal, is designed to serve over 215,000 alumni of Illinois State University, as well as current students, faculty/staff, and the Bloomington/Normal community. ^ "ISU President Tim Flanagan resigns amid assault claim - News - Journal Star - Peoria, IL". Pjstar.com. March 22, 2014. Retrieved April 5, 2016. ^ "Dietz Named Illinois State's 19th President | Media Relations". Mediarelations.illinoisstate.edu. Retrieved August 23, 2014. ^ "About | Provost - Illinois State". Retrieved June 22, 2017. ^ "Freshman Enrollment Falls at Illinois State University". Illinois Public Media News. Retrieved September 12, 2017. ^ ISU Graphic Standards (PDF). January 1, 2009. Retrieved April 5, 2016. ^ "College of Education, Illinois State University". Coe.ilstu.edu. Retrieved October 9, 2011. ^ Poshard, Glenn (September 2007). "A Message To Alumni From SIU President Glenn Poshard". Southern Alumni. ^ a b "Quick Facts". Archived from the original on September 29, 2014. Retrieved September 19, 2014. ^ Inaugural Meeting of the Board of Regents, Illinois State University, April 1967. ^ "Illinois State University Overall Rankings". U.S. News & World Report. 2018. Retrieved November 15, 2018. ^ "Illinois State continues record-setting enrollment trend". news.illinoisstate.edu. Retrieved February 12, 2017. ^ "Illinois State University "Quick Facts"". Admissions.ilstu.edu. Retrieved February 6, 2015. ^ "Fell Arboretum – Illinois State University". Arboretum.illinoisstate.edu. May 14, 2011. Retrieved October 9, 2011. ^ "Wattersons Believe it or not... – Features". Archived from the original on August 13, 2007. ^ "Cardinal Court". Archived from the original on December 29, 2014. Retrieved September 19, 2014. ^ "Illinois State University Circus". Retrieved October 25, 2008. ^ "NFA National Tournament: Team and Individual Champs 1990–1999". Cas.bethel.edu. Archived from the original on May 29, 2010. Retrieved October 9, 2011. ^ "Afa-Niet National Champions". Americanforensics.org. Archived from the original on September 27, 2011. Retrieved October 9, 2011. ^ "1999 NFA Interpretation Elim Rounds". Cas.bethel.edu. Archived from the original on September 4, 2006. Retrieved October 9, 2011. ^ "Home – Illinois State Club Baseball". Isuclubbaseball.com. Archived from the original on July 13, 2011. Retrieved October 9, 2011. ^ "Western Illinois University at the Legends and Lore of Illinois". Archived from the original on May 23, 2011. Retrieved June 21, 2011. ^ Home page Archived February 5, 2015, at the Wayback Machine. Bloomington/Normal Japanese Saturday School. Retrieved on March 31, 2015. "The facility of Metcalf Laboratory School that we have been using since 1986 allows us to enjoy full use of class rooms as well as gym and outdoor playground." ^ "~ 学校の概要 ~ Archived February 5, 2015, at the Wayback Machine." Bloomington/Normal Japanese Saturday School. Retrieved on March 31, 2015. "郵便送付先： 1413 Heritage Road West, Normal, IL 61761"
Freed, John, "The Founding of Illinois State Normal University: Normal School or State University?" Journal of the Illinois State Historical Society, 101 (Summer 2008), 106–26. Freed, John B. 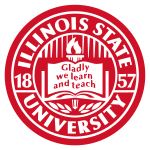 Educating Illinois: Illinois State University, 1857–2007. Virginia Beach, VA: Donning Company Publishers, 2009. "Illinois State Normal Institute" . Collier's New Encyclopedia. 1921.